Here's an all too common proverb in Italian: sbagliando s'impara. One learns by making mistakes. And boy oh boy, am I ever learning a thing or two about veggie gardening, which I have just gotten into, despite the tragic fact that I live in rocky and foul-weathered New England. I can't begin to tell you of my travails with the reputedly (hah!) 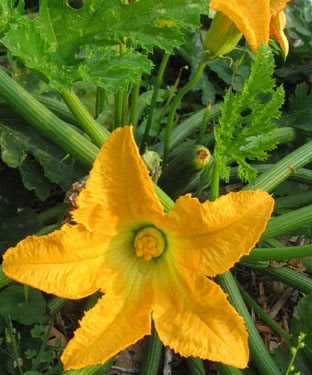 easy to grow zucchini. According to the Burpee seed packet, I should be harvesting the damn things by now, since I started them in April in a greenhouse in which I rented a space for this purpose. That is, to lengthen our stupid growing season in Massachusetts. But noooooo. I just now got two zucchini flowers, and I can't even eat them because they're male flowers that are supposed to pollinate the female flowers, that haven't even showed up yet. Sometimes they can't even get it on on their own, and you're supposed to hand pollinate them. I don't think so. At that point, I'm headed to the nearest Farmer's Market or Shaw's supermarket. What a steep learning curve, I tell ya. Italian learners: notice that sbagliando is a gerund. Also notice that s'impara is reflexive in Italian, whereas it would not be in English. Unfortunately, reflexive verbs are not necessarily the same in Italian and other languages, so that you need to memorize what is reflexive in Italian (verbs can of course be both reflexive and not reflexive). Update, 6/19/12. "Faithful reader" Steve Cabito has correctly noted that s'impara here is obviously not a reflexive but impersonal use of si. What was I thinking? Distraught by my high-maintenance zukes? Here are more examples of impersonal si. Gentlemen are born, not made. Come si dice zucchina in inglese? How do you say zucchina in English? One should not tell lies!